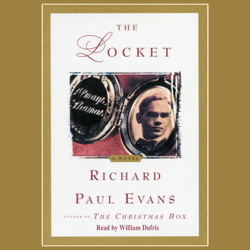 The Locket marks the beginning of an entirely new series of audiobooks from Richard Paul Evans, the bestselling author of the Christmas Box collection. With this beautiful novel we learn that we are all given second chances, but that sometimes they are best given to someone else. I would so rather say these things to your face, but, as we both know, life doesn't often take requests...first, I do not know yet the outcome of the trial. I cannot know if you are reading this in a cage. I have faith that you will be free so I shall write this letter as such and not take counsel from my fears. In the top drawer of my armoire is a velvet pouch containing two heirlooms. The first is my locket. I would like you to return it to Betheltown for me -- to lay it by the hearth of the fireplace where I left my love so many years ago. I am certain that the roads will be grown over; but you will know the place. After the death of his mother, Michael Keddington finds employment at the Arcadia nursing home, where he befriends Esther, a reclusive but beautiful elderly woman who lives in mourning for her youth and lost love. 'Do you suppose life gives us second chances?' Esther asks Michael one day. 'I don't know. But we'd probably just make the same mistake over again,' he concludes. Michael faces his own challenges when he loses his greatest love, Faye. When Michael is falsely accused of abusing one of the Arcadia's residents, he learns important lessons about faith and forgiveness from Esther, and her gift to him of a locket, once symbolic of one person's missed opportunities, becomes another's second chance.